Our St. Johnswort extraction is made from hand-gathered plants which are in full bloom here in the Berkshires of Western Massachusetts from approximately the feast of St. John at the end of June through July. 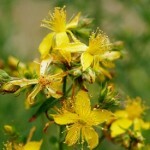 Long considered helpful for nerve-related anxieties of either depression or over-anxiety, St. Johnswort is now being lauded as the natural alternative to Ritalin for some ADD conditions. Note: Stop taking this herb 2 weeks before surgery. Some reports of photosensitivity.